Home Concepts Electric Energy Environment Ideas Questions Science Is It Possible To Power The World With Tornadoes ? Is It Possible To Power The World With Tornadoes ? Louis Michaud has received funding from Peter Thiel’s Breakout Labs to harness energy through manmade vortexes. Will your streetlights soon be powered by a tornado? Many retired men enjoy tinkering in the garage to fill the hours, working on an old Jaguar XKSS, say, or building a dollhouse for a new grandkid. And then there is Louis Michaud. 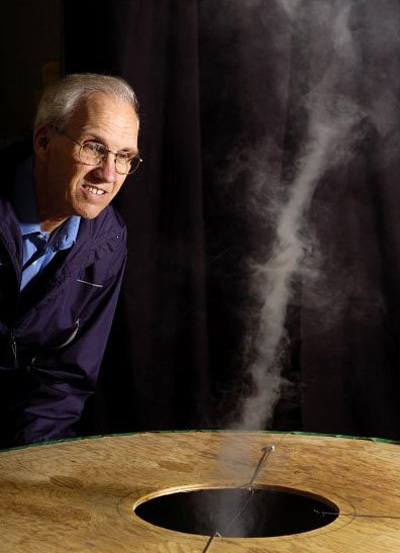 Michaud, a 72-year-old grandfather and former ExxonMobil engineer, has spent his golden years trying to manufacture tornadoes--tornadoes that, he believes, could eventually power the world. Michaud has built a prototype of what he calls a vortex engine--a plywood contraption just 2 feet tall and 4 feet wide that is capable of whipping up tiny vortexes. The vortexes aren’t big enough to create electricity. But Michaud thinks that scaled up, organized, controlled atmospheric vortexes could help create what he says will be the “most favorable energy source” on the planet — by his estimates, generating as much as 3,000 times the electricity generated worldwide today. Pie-in-the-sky though the idea may seem, it has secured the backing of billionaire Peter Thiel’s Breakout Labs, which funds innovative companies. Now all Michaud needs to do is prove it works. Michaud has always been intrigued by alternative energy. Decades ago, while he was still working for ExxonMobil, he started thinking about the vast power potential of rising air. He theoretically worked through the process of capturing energy via water vapor that would condensate as air rose, but calculated that too much energy would be lost in the process to make it worthwhile. 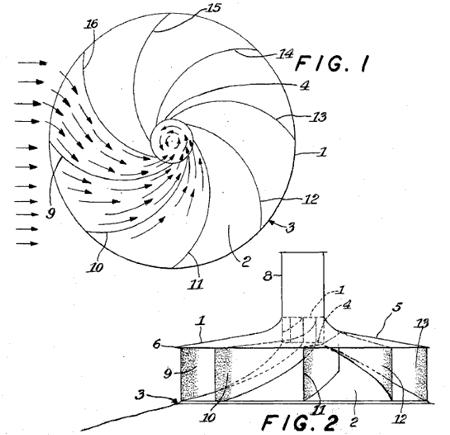 It was then that he realized that building a controlled vortex, or tornado, would be more effective, because it would be easier to capture the energy of moving air via a turbine than to capture the energy involved in condensation. He made his first prototype of the Atmospheric Vortex Engine (AVE)—a machine that produces mini tornadoes--in 2005, and launched the Ontario, Canada-based company AVEtec the following year to see the project through. To understand how artificial tornadoes could generate electricity, it helps to know how a tornado works in the natural world. 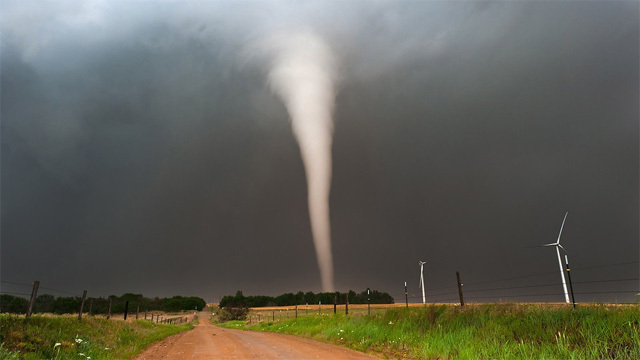 Tornadoes start when conditions are just right, when air closest to the Earth’s surface is at least 20 degrees Celsius warmer than the air above. The ground air rises and starts to spin so vigorously and consistently that it forms a vortex. To replicate that process in an AVE, Michaud creates a cylindrical chamber with entryways that allow hot air, either captured from a source of heat-waste or created artificially, to rush in. The hot air moves in the same direction and starts to rise in a circular pattern creating a vortex. The vortex grows taller and taller as it pulls in even more hot air from the bottom entryways. Higher up, the wind speed of the tornado will spin the wheels of attached turbines, generating energy. So far, Michaud has built seven prototypes, though all of the models have produced vortexes under 20 meters in height, and these small vortexes only generate a miniscule amount of energy. “When the vortex is less than 20 meters in height, [generated power] is invisible,” he says. As the vortex size increases, the amount of energy produced increases exponentially, Michaud’s theory predicts. One easy way to make vortexes? Power plants. In the models he’s created so far, he’s used energy sources to heat up the air that is fed into the bottom of a vortex, either through electricity or by concentrating solar energy. But if he were to partner with power plants, that initial energy investment wouldn’t be necessary. Power plants already generate waste energy via heat. An AVE would use the waste energy to begin and maintain a vortex. Adding that capacity would “increase output [of the power plant] by 10 to 20 percent, without using any additional fuel,” Michaud theorizes. And the vortexes that would result could rise a whopping 15 kilometers in the air (natural tornadoes have clocked in at almost 9 kilometers high). The potential would be greater than that of either nuclear power or fossil fuels, at less than half the price of the lowest traditional power source, Michaud says. By his reasoning, the total energy potential of convection from the bottom of the atmosphere upward is 52,000 terawatts. He believes it’s possible to collect 12 percent of that potential using his technology, which amounts to 6,000 TW--3,000 times the 2 terawatts of electrical power we make world-wide without his method. Nilton Renno, a professor at the University of Michigan and an atmospheric convection expert, believes Michaud’s calculations assume that AVEs cover the entire surface area of Earth. Not likely to happen any time soon. Michaud’s plans also make Renno a little nervous. While the theory behind AVEs is solid, scaling them up to the size AVEtec requires could go awry, Renno says. “The problem is that if you create a storm, you force it to be organized and I don’t see any guarantee that the storm won’t get disorganized,” he says. “The chance of the vortex going outside the station is minimal,” Michaud says. “What you’re doing is feeding it from the bottom,” he says, adding that simply closing the lower vents that feed hot air will stop the cycle and kill the tornado. For complete control to be maintained, there must be several ways to turn off the lower vents, Michaud says, comparing it to how a nuclear power plant has several redundancies to prevent a meltdown. Moreover, Michaud says that if the vortex engines remove hot air from surrounding areas, they could actually prevent a tornado from occurring, as there’s less heat to start one. But that’s all floating around in the tidy little world of thermodynamics theory. For now, Michaud needs to prove his concept with a real sample. And to prove his concept, he needs to scale up. Soon after founding his company in 2006, Michaud—who admits that bringing his idea to fruition has become his “dominating life goal”—started looking for funding. He tried different channels of government funding, but didn’t have much luck until he came across a new program started by the Thiel Foundation, the philanthropic group founded by billionaire and PayPal co-founder Peter Thiel. Thiel is perhaps best known for his Thiel Fellows, which pay kids under age 20 $100,000 to work on a project for two years rather than attend college. In November 2011, the Thiel Foundation launched Breakout Labs, which is aimed at funding innovative ideas that need financial support to get to the next level, says Hemai Parthasarathy, the scientific director of the program. “We’re trying to fund companies that market rate investors are not quite ready to take a risk on,” she says. When Michaud came across the program in 2012, he knew he was a good candidate, and applied for a grant. In December 2012, AVEtec became the first international company to receive a Breakout Labs grant of $300,000. The money has allowed him to partner with Lambton College in Ontario, and currently he’s building a larger AVE prototype on their campus. This vortex, he says, will have a 26-meter diameter and while the structure will be just 20 feet tall, the vortex will extend 100 meters into the air. Once the project, already in the works, is completed, they’ll use the turbine to power a light bulb, proving the electricity potential of the vortex. Michaud is grateful for the Breakout Labs funding, though he says that in comparison to what power companies could give, this is “pretty small potatoes.” He is trying to use the money “as sparsely as possible,” and hopes to just get enough to prove the technology’s worth to larger companies in the energy sector. Michaud admits that even under perfect circumstances, it would likely take two to three years to build a working version of an AVE at the necessary size. In the future, Michaud hopes to attract interest from larger funders and perhaps partner with larger companies. He believes that his AVEs have the potential to be a “major electrical energy producer,” and one that will be cost-effective. Building AVEs will reduce our reliance on fossil fuels, he says, and that will reduce emissions in turn. When Thiel was deciding whether to give AVEtec the funding, he asked Michaud what the most favorable outcome of his project would be. Michaud answered that he would be able to increase the amount of energy available per person, worldwide, an accomplishment that could ultimately improve living standards and fight poverty. Let’s get those vortexes turning.